Home » Blog » Best Coaching Classes for CAT and Top Institutes – IMS / TIME / CL / Online? Looking for the Best Coaching Classes for CAT? 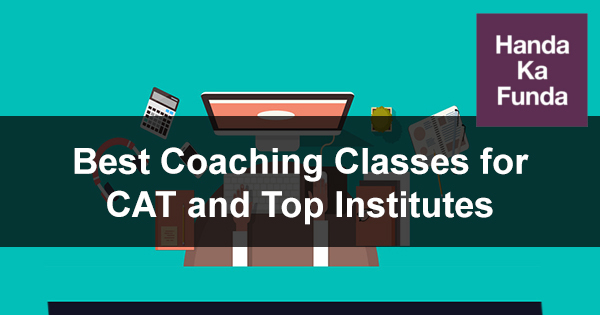 One of the first things that CAT aspirants look for, specially those appearing for the first time, is a “coaching institute”. The choices, more often than not, are mind-boggling and confusing to say the least. Also, everyone wants to join the “best coaching classes” and the “Top CAT Coaching Institute” in the city. And as the bard would say, therein lies the rub. The coaching institute you pick is going to make very little difference to the final result. But then again, everyone wants the “best”. I thought I will write this post to share my thoughts on choosing a coaching institute. I personally think that joining an offline brick-and-mortar coaching institute in today’s day and age is waste of time, money, and effort. This thought has been validated year after year looking at the results of some of my students as well. But for this post, I will purely talk about offline CAT coaching institutes. Now you might be wondering – Why am I helping my competition? Why am I even promoting an idea that I do not believe in. Well, it is because quiet a few of the students, for reasons that I do not understand, still prefer offline CAT coaching classes and CAT coaching institutes that are located in their city. You can read about the benefits of online CAT preparation here and if you are convinced, you can have a look at our online CAT Coaching course. How to identify the Top Institute for CAT Coaching? How are the demo classes at CAT Coaching institute? These are not pants or shoes that you need to try. Also, like pants or shoes, you do not have the ability to actually judge the quality of a teacher from one or two classes. The effectiveness of his teaching will become evident in the long haul. I won’t even go into the unethical practices employed by some coaching institutes where faculty X takes the demo class, and faculty Y takes the actual batch. Another thing which is common is that in the demo class, stuff is taught in a fashion that it impresses the student and consists of stuff that is not really relevant to CAT preparation. How many classes are there in the course? The content is of how many hours? Will there be 2 classes a week or 5 classes a week? Once again, you are not buying a coke bottle that 500 ml will be better than 400 ml. You just need to ask one question, does it cover the entire CAT syllabus? – more often than not, the answer will be yes and that is all you need to care about. Past results make an institute the best CAT Coaching Class? We all understand that past performance is no guarantee for the future. It is not even a useful way of assessing how good or bad a coaching institute is. It is just a reflection how good or bad their marketing has been and have they been able to attract good talented students in the past. For example, one of my students Utsav Bhattacharjee got a 99.72%ile. Another student, Rajeev Kumar, got a call from IIM-A. Another student, Amardeep Singh, got an IIM-A call while preparing from Singapore. I am using their names because they did not join any offline coaching classes. They had taken my online course. Does that mean that if you join the online course, you will be able to match their performance – not at all. Their performance is just that – THEIR performance. A coaching institute is like a bat. Getting the same bat as Sachin will not make you a great international batsman. Heck! It won’t even get you selected to your hostel team. You can check our ‘Results and Testimonials‘ as well. A lot of coaching institutes advertise that they have faculties from IIMs and IITs and other top colleges. After spending close to a decade in the MBA coaching industry, I can say without a doubt – degrees don’t matter when it comes to faculty. It is how interested and motivated the teacher is – that is all that counts. Even I have mentioned my alma mater IIT Kharagpur on the homepage. I make it a point to mention it in almost all demo videos. I do that because it works. It is purely a marketing exercise – nothing more, nothing less. There are other ways to judge the faculty. Is ‘Brand’ everything at a top CAT Coaching Institute? So, how to actually decide which coaching institute to join? Keeping all the above factors in mind, the biggest factor that you should consider is convenience. At the end of the day, it is YOU who needs to attend the classes. It is YOU who needs to put in the effort. You should pick a coaching institute that is close to your home / office / college. You should pick a coaching institute where you will be able to attend 100% of the classes offered. You should pick a coaching institute which has a batch that suits your timings. Do not compromise on these things one bit. Everything else will become irrelevant if you are not able to attend the classes. Hope this post will help you make the right choice for the coaching institute. And obviously, if you want to learn online – you can always enroll for our online course. If you found this post helpful, don’t forget to share it on Facebook / WhatsApp / Tweet it.